There is a fleet of new Matrix gym equipment at the Bay of Isles Leisure Centre. Have you tried it out yet? The equipment features a timer and counter to help you keep track of sets and QR Codes so you can scan and watch tutorial videos, but don’t forget the staff can help you too! With twenty new workout stations you’ll be able to enhance your workout routine. The new equipment even sounds nice! 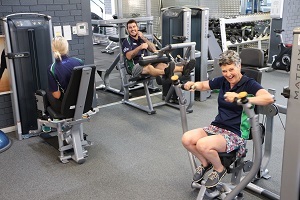 The Bay of Isles Leisure Centre is a great place for recreation and relaxation, with something for the whole family, not only is there a fully equipped gym, but there is a choice of four heated pools, fitness classes, access to personal training, a crèche and Learn to Swim programs. There’s also a range of membership options to cater to your needs. The pool will be getting an upgrade soon and will be closed during that time. Stay tuned for more updates.